As much as I love the Avene Hydrance Optimale Hydrating serum I am a beauty blogger and therefore the allure of trying other products is always strong. 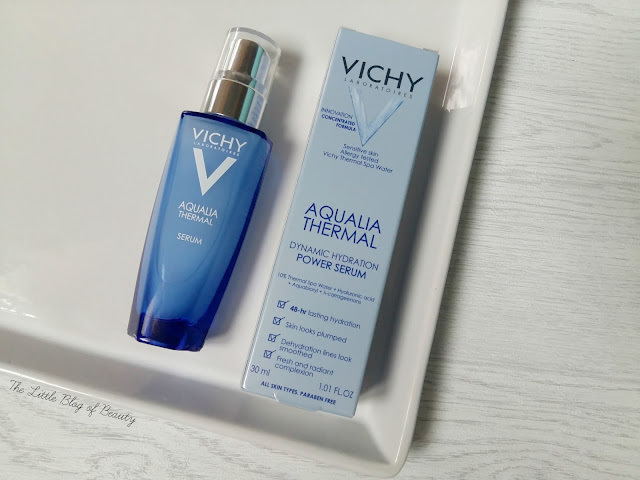 I was fully aware the Vichy Aqualia Thermal Dynamic Hydration Power serum is a blogger favourite so when I got through my last bottle of the Avene serum I decided to give the Vichy one a try. The Vichy power serum (I feel like I need to shorten the name a little!) offers 48 hour hydration and a fresh and radiant complexion with plumped skin and smoothed dehydration lines. It contains 10% thermal spring water and hyaluronic acid. Packaging wise it comes in a blue tinted glass bottle that you can see through so you can see how much is left in the bottle. I don't believe you can remove the lid to get into the bottle but as it comes with a pump there shouldn't be a problem getting all of the product out. There's a clear plastic cap over the pump to stop it dispensing if it's stored in a wash bag but I don't find this lid very secure. If I pick the bottle up by the lid it often comes off, meaning the bottle drops, and when I take this out of my wash bag the lid has often come off. I find the pump dispenses quite a lot of product and for me at least this is far too much. If I applied it to my neck as well (which I probably should start doing) the amount of product might be more appropriate but I only apply it to my face. About half a pump at the most would probably work best for me. The way I've been trying to use it is to do a mini pump to get enough for one area of my face, forehead, one cheek, chin etc, but this is difficult to do and I often end up with more than I wanted. When I first started using this I applied a whole pump to my face and was really disappointed to find that it didn't absorb fully and left my skin feeling tacky. I reduced the amount I was using and still found that it left my skin tacky. I then discovered that it was just my skin throwing a wobbly and refusing to absorb products and more recently this has been a lot better, as long as I don't use too much. I'm a big fan of hydrating serums and this does exactly what I want. It moisturises my skin leaving it soft, smooth and flake free and ready for makeup. If I feel like I need to follow up with a moisturiser on top then I will but if my skin is being particularly good or I'm in a hurry this is often enough. I wouldn't say it provides 48 hours hydration but then my skin is often dehydrated and as soon as it comes into contact with water it becomes dry. I would consider using this again but in general I don't think I would chose this over my current favourite Avene Hydrance Optimal Hydrating serum. The loose top is one reason for this but also because the Vichy serum is £22.50 whereas the Avene serum is £17, so there is over £5 difference in price between them. I really like this serum, I prefer the Idealia one but I think both are lovely! Thanks for the review, chick! I've been eyeing up the Vichy ranges but I have no idea where to start!